For many years we have had the opportunity to help women and men maintain healthy and youthful looking skin. Our aesthetician has over 20 years’ experience working with clients who are from different cultures, as well as ages and skin types. She is trained, licensed and certified in Advanced Skin Care, Micro-Dermabrasion, Cavitation, Micro Needling to Radio Frequency & Ultrasound. ​Intensive TreatmentsAt the heart of the SOTHYS skin care programs are the Intensive Treatments. Each cutting-edge, professional-only treatment utilizes the latest bio-technology to offer cosmeceutical-grade solutions second to none. Furthermore, clinical tests guarantee their effectiveness, results and customer satisfaction. Each is designed to correct the signs of aging and transform the way skin should look and react, without invasive methods or down-time. Erase skin imperfections by changing the way your skin visibly ages. PEVONIA has been the leader in delivering natural skincare solutions to the finest spas and professional aestheticians worldwide. ​You can take some of the spa experience home. From anti-aging to rosacea, acne to dry skin, eyes and lips, Pevonia has an aesthetician-proven solution to every skin concern. We also offer spa quality body products for de-aging, safe sun, and even hands and feet. ​Pevonia products are frequently featured in exclusive magazines throughout the world. Editors praise our natural skin care solutions for the outstanding results they deliver. 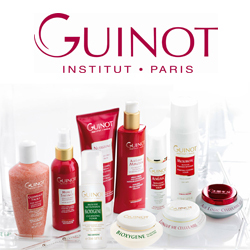 ​A complete line, GUINOT PARIS provides a wide range of beauty care, covering three specific categories; face, body and sun. In each category, the company’s philosophy of professional expertise as a guide to product use is an important part of the skincare message..
​Fundamental to this is the Guinot creed which points out that every person's skin is different and is exposed to different environmental and stressful conditions at different times. It is the synergy of professional services and skincare products that results in beautiful skin, for which Guinot Paris is renowned.